Not quite ready to try the whole 226km? Then we have an option for you! 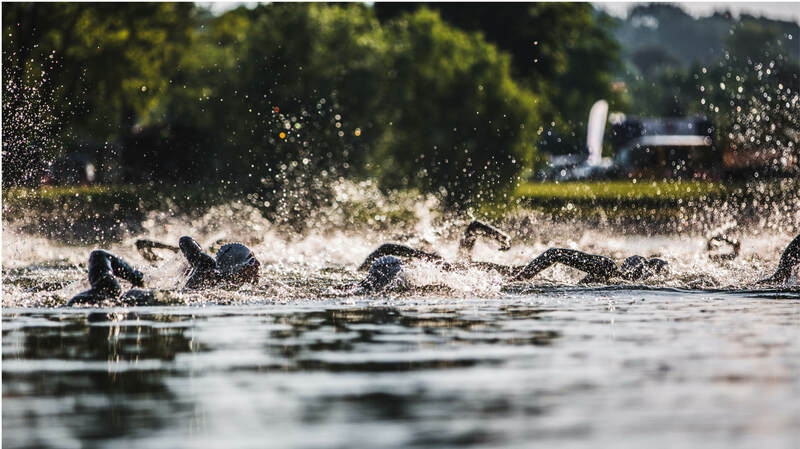 Why not try the relay triathlon? Choose a team of between 2 and 11 competitors and do your best to catch up with the individuals. How the course is made up: 3 × 1,267m swimming + 4 × 45km cycling + 4 × 10.548km running. You can choose who does what, and you’re welcome to change competitors whenever you like, as long as they’ve passed all the checks and finish lines. All you have to do is pass over the starting number (just like a baton) in one of the marked handover areas. Cycling – there will be aid stations every 22.5kms. Escorts and competitors not currently at the set point will not be allowed to enter the aid stations. Aid stations places where you can get your own refreshments from escorts will be marked. Run – there will be an aid station every 2.8kms. Every 4th aid station will be big. You’ll be able to get your own refreshments from escorts up until 100m before the aid stations. Competitors or teams that do not finish the triathlon within the set time limits will be disqualified. If they finish after the set time, their time will not be displayed with the rest of the results. Swimming – the maximum time allowed for the swimming part of the race is 2 and 20mins. 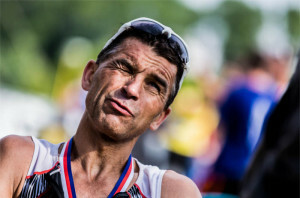 The swim must be completed by 10.20 a.m.
Cycling – the time limit for both the swimming and cycling is 10 hours, which therefore means all participants must finish cycling by 6.00 p.m.
Run -­ The time limit for the swimming, cycling and running is 16 hours, meaning the race will finish at midnight. Relay for a 2-11 member teams (3×1,267m swimming, 4×45 km bike ride, 4×10,548m run). You can choose who does what, and you’re welcome to change competitors whenever you like, as long as they’ve passed all the checks and finish. The starting number and chip act as the relay baton. The relay will start an hour later than the individuals. The individuals will set off at 7am, and the relay at 8am. The finish time will be at midnight too. Three circuits of Štěrkoviště lake. Competitors have to get out of the water after each circuit. Four circuits of the route that takes you through Otrokovice, Hulín, Otrokovice, Kvasice, Tlumačov, turn, Kvasice Střížovice, Kroměříž-Kotojedy, turn around and back through Střížovice, Kvasice, Otrokovice. The cycling route might have to be changed slightly depending on talks with the authorities. The elevation rate per circuit is 208m. Four times round Otrokovice, Bělov, Kvasice and back. Part of the road around Štěrkoviště will be closed during the cycling and running. The running route might have to be changed slightly depending on talks with the authorities. All competitors must attend the presentation the day before the race – Friday June 21, 2019. If for any reason all team members can’t be present, please let us know by emailing (v.silvie@seznam.cz), a “Competitor’s Declaration” form will be posted and you’ll have to list and ask all members to sign it. The briefing is just as important for the relay as you will find out about the handovers and aid stations etc. This is also the ideal time to ask whatever questions you may have. Storage – There isn’t any storage for relay teams. Competitors in the relay should wait at the handover area with their bike (after the swim that’s normally by the depot. During the cycling a special handover section will be marked). Only the competitor and the competitor being handed over to will be allowed to enter the area. Other team members are not allowed on the track). 8.00 a.m. – Race Start– in the start and finish area at Otrokovice in Štěrkoviště. How much and what for it? The entry fee after the 1.5.2019 will be increased to 185 EUR and 25 EUR per team member! The cancellation fee is 50% of the paid entry fee. After 10 June, 2019, the cancellation fee will be 100% of the price. Captain will have to fill out the registration together. And payment together too. All payments should be made to account number 1411129399/0800.Czechtriseries will give you a variable symbol which will need to be entered when making the payment. Please also enter your (the competitors) surname in the message box. If the payment hasn’t been received by the organisers, please bring with you some form of proof of payment. If you don’t manage to make the payment before the deadline, please pay in cash at the presentation instead. Thank you. For those competitors who’d like to stay in style. About 20km from the start, complete with rehabilitation facilities for after the competition.